three reasons home care might be right for you and your parent. Moving out of a familiar setting is often stressful and emotional for seniors, which can make transitioning to a retirement community difficult. Seniors almost always prefer staying in the comfort of their own homes, and it's many times the better choice for them. Being at home can allow seniors to hold onto their independence for longer and be in more control of their care. In-home senior care also allows senior clients and their families to get exactly the amount and type of care they need. Courtesy care providers can work with seniors to build the exact care program that's right for them, from which days they need care to which types of tasks they'll need assistance with. 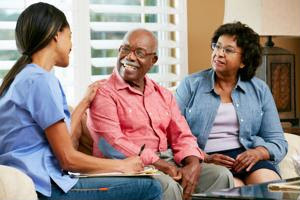 One of the best aspects of home care is that it's a much more personal experience for clients. Seniors and their families get to choose the home care provider, and whoever they choose will work with them one-on-one.